Rollers ( Idlers ) used in normally Material Handling Systems such as Belt Conveyor, Roller Conveyor etc for moving material from one place to another with less man power / expense. We are providing idlers with Powder Coating, with Locating Stand Also. 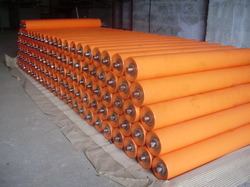 Looking for Conveyor Rollers ?